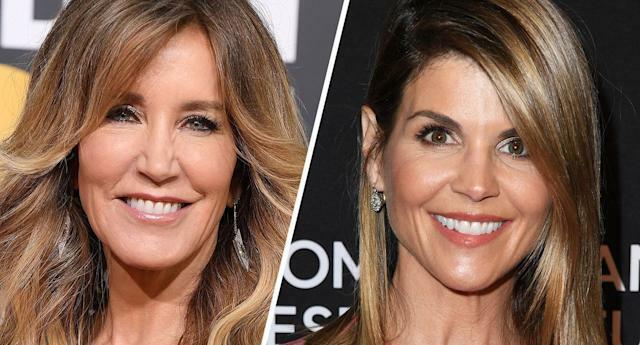 Federal authorities on Tuesday charged 46 people, including actresses Felicity Huffman and Lori Loughlin and college coaches and administrators, in an alleged scheme to win admission to prestigious universities for the children of wealthy parents. At a press conference Tuesday, U.S. Attorney for the District of Massachusetts Andrew Lelling called the scheme the “largest college admissions scam ever prosecuted by the Department of Justice.” Yale, Stanford and Georgetown universities were among the schools identified as having been duped into accepting unqualified applicants. Lelling said the operation, allegedly run out of a Newport Beach, Calif., college-admissions coaching company, had several parts, including coaching applicants to cheat on SAT and ACT admissions tests and bribing athletic coaches to identify applicants as potential recruits who could be admitted under athletic waivers requiring lower academic standards. Among those charged in what law-enforcement officials called Operation Varsity Blues are 33 parents, the owner of the California firm, SAT and ACT test administrators, an exam proctor, a college administrator and college coaches. The FBI said that many of the students — some of whom have already graduated — were kept in the dark by their parents and didn’t know about the scheme. No students were indicted. William Singer, who ran the California company, called Key Worldwide Foundation, was charged with racketeering, money laundering, obstruction of justice and conspiracy to defraud the United States. Singer, according to Lelling, laundered money he received from parents under the guise of charitable donations. He is one of two charged as co-conspirators who Lelling said he expected to enter guilty pleas Tuesday. “Between 2011 and 2018, wealthy parents paid Singer about $25 million in total to guarantee their children’s admission to elite schools such as Yale, Georgetown, Stanford, USC, University of Texas, UCLA and Wake Forest,” said Lelling, adding, “We're not talking about donating a building so that a school's more likely to take your son or daughter. We're talking about deception and fraud." That issue is well known. I don't know why NOW it becomes blasted on media. I'm surprise Brown University is not on the list too...maybe they fixed it before it became a mess.